2. Disconnect the white (neutral) wire that powers the outlet of the triggering device (e.g. a clothes dryer). Extend this wire through the hole in the AC Current Switch (SW100) and reconnect to the triggering device's outlet. 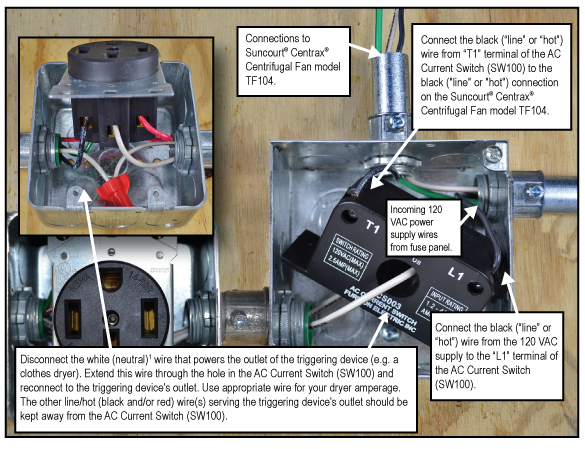 The other line/hot (black and/or red) wire(s) serving the triggering device’s outlet should be kept away from the AC Current Switch (SW100). 3. 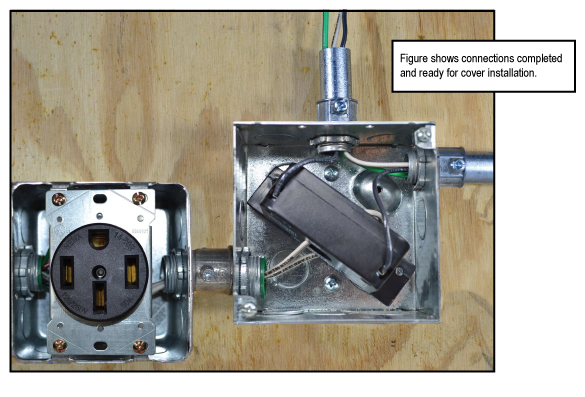 Run a 120VAC power supply cable to the new junction box. This will serve as the remote device's (e.g. a Suncourt® Centrax® Centrifugal Fan) power supply. Extend the neutral and ground wires to the remote device (e.g. a Suncourt® Centrax® Centrifugal Fan). 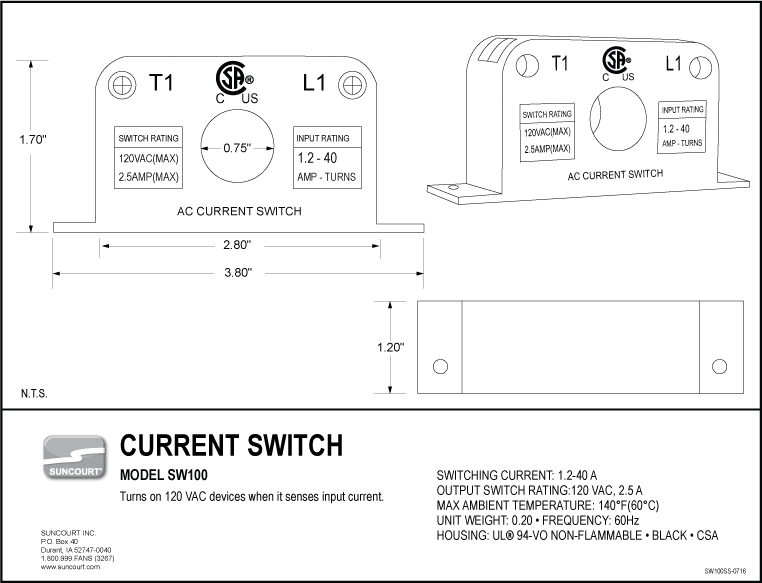 Connect the black (“line” or “hot”) wire from the 120 VAC supply to the “L1” terminal of the AC Current Switch (SW100). 4. Connect the black (“line” or “hot”) wire from “T1” terminal of the AC Current Switch (SW100) to the black ("line" or "hot") connection on the remote device (e.g. a Suncourt® Centrax® Centrifugal Fan). 1. Products sold damaged or incomplete, sold “as is”, sold reconditioned or used as rental equipment. 2. Delivery, installation or normal adjustments explained in the owner’s manual. 3. Damage or liability caused by shipping, improper handling, improper installation, incorrect voltage, current in excess of the 2.5 A switch rating or improper wiring, improper maintenance, improper modification, or the use of accessories and/or attachments not specifically recommended by the manufacturer. 4. Repairs necessary because of operator abuse or negligence, or the failure to install, operate, maintain and store the product according to the instructions in the owner’s manual. 5. Damage caused by cold, heat, rain, excessive humidity, corrosive environments and materials, or other contaminants. 6. Expendable items that become worn during normal use. 7. Freight costs from customer to vender. 8. Repair and transportation costs of products or parts determined not to be defective. 9. Any incidental, indirect or consequential loss, damage, or expense that may result from any defect, failure or malfunction of the product. Some states do not allow the exclusion or limitation of consequential damages so the above exclusions or limitations may not apply to you. Some states do not allow the exclusion or limitations on how long an implied warranty lasts, so the above limitations may not apply to you. You may have other rights which vary from state to state.